the residents of Downey is my passion. Used to be, cosmetic dentistry was about getting white, slightly larger than your teeth replacements that weren’t necessarily suited to your face and personality. Plus the foundation of your real teeth had to be destroyed to make room for your restoration. Sure, they looked good but the price for that smile was too great many times. 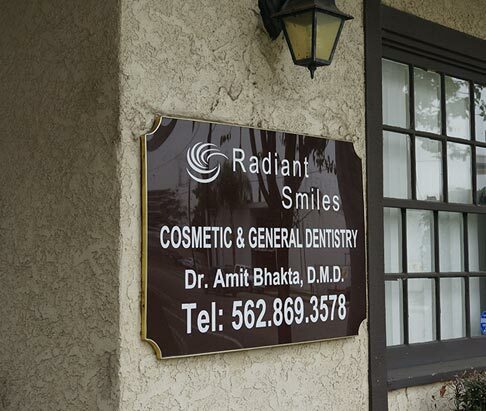 Popular Cosmetic Dentist Dr. Amit Bhakta followed a different path. For the past 11 years, he has pursued aesthetic dentistry, using minimally invasive techniques to create stunning, crafted smiles that far outlive traditional methods. In order to choose the correct technique to enhance your smile, Dr. Bhakta uses the dento-facial aesthetic diagnosis system. This allows the ability to blend your specific goals with the 25 perameters of dento-facial aesthetics. Smile Shaper Veneers – These super thin veneers are a great option to repair damaged and worn out teeth and they are remarkably durable. The best part?! Dr. Bhakta doesn’t remove the patient’s sensitive tooth structure. He’s known for minimally invasive dentistry. Instant Orthodontics – Porcelain dental veneers can also function as “instant orthodontics.” People experience an immediate straightening, gaps are eliminated, and the minor bite is corrected. Many porcelain dental veneers patients find that the results of their instant orthodontics are exceptionally beautiful and natural looking. Zoom!® Teeth Whitening – Convenient, simple, and dramatic results. Dr. Bhakta applies this professional bleaching gel to remove teeth stains. The Zoom! Teeth Whitening System makes your teeth eight shades lighter in a single visit! Zoom!